Why did the people weep? It was because 10 of the 12 spies that Moses sent into the promised land came back saying it was impossible. And the people believed them instead of believing God. They mourned as if they were already defeated when in truth, they had not even begun. Be careful how you use your imagination. You can feed your worst fears or you can feed God’s best hope for your life. This nation of former slaves looked at the promised land in fear because it was going to be difficult. They wanted the promise but only if God was going to make it easy for them. Stepping into your promised land isn’t going to be easy. You are going to have to fight for it. Fight fear, fight the lies of the enemy, fight your own ingrown old slave mentality. It is going to be one step of faith after another. 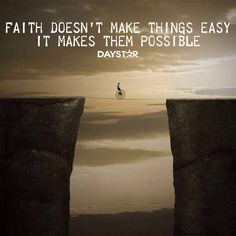 It will always be a faith walk. to do what He has called you to do. Exactly what I needed to hear at this time in my life:-) Thank you!